For audiences that remember Red Skelton, Tom Mullica's performance will be not only a sweet reminiscence of a time gone by, but a reminder that comedy can be clean and still be brilliant. Mullica, a close friend to the late Red Skelton, expertly portrays the comedian and his host of lovable characters including Klem Kadiddlehopper, Gertrude & Heathcliff, the mean whittle kid, Freddy the Freeloader, and many more. He seems to magically transform himself into Skelton live on stage complete with rubber-faced pantomimes, ageless sight gags, obscenity-free jokes, and his legion of memorable characters. Mullica perfectly recreates Skelton's gawky and silent open-mouthed laugh, the easy midwestern drawl, and his characters' flirtations with anger and frustration. He never breaks character, ad-libbing with the audience as Skelton and introducing each of Skelton's classic routines. Skelton's flair for physical comedy is best reflected in Mullica's reprise of 'Guzzler's Gin,' a Skelton favorite skit in which a thirsty TV pitchman gets positively pig-eyed. Mullica handles Skelton's voices, mannerisms, and expressions with the skill of a veteran actor who cares deeply about his subject. Mullica was a long-time admirer of Red Skelton and became a good friend for about the last decade of the comic genius' life. Skelton caught Mullica's act in his Atlanta club and decided to mentor the younger comic, making him realize that laughter could come from deeper source than shock value. He made him a promise that if he cleaned his act up, he could use his material. Mullica has turned that material into a one-man tribute to his idol, and by all accounts, the similarities between the two men are astonishing. Mullica has Skelton down to a science, from characterization to movements to vocal technique, breathing life into the comedy that made America laugh for decades. 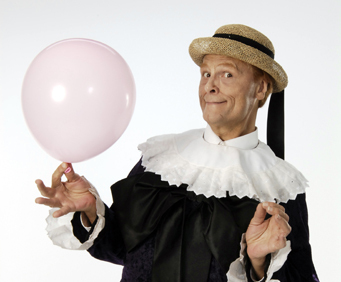 For both audiences that remember Red Skelton and those who are new to his comic genius, Red Skelton: A Performance Tribute by Tom Mullica will be an amazing afternoon of laughter and fun.